I just completed a very interesting and frankly troubling book, “No Place to Hide: Edward Snowden, The NSA, and the U.S. Surveillance State”, by Glenn Greenwald (copyright 2014). Glenn Greenwald is the reporter who broke the Edward Snowden story about NSA surveillance. 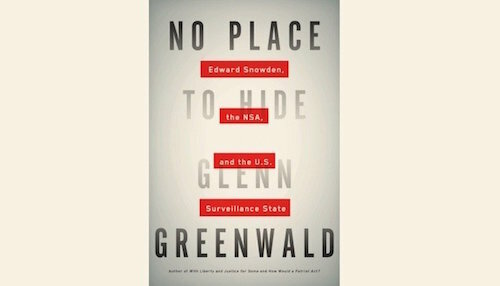 The book tells the story of how Greenwald was contacted by Snowden, how their relationship developed, and how Snowden ultimately convinced Greenwald to publish Snowden’s information concerning the depth and breadth of NSA surveillance activities. The “behind the scenes” story about Edward Snowden, his personality and state of mind, his motivations to risk martyrdom as a whistleblower against possibly the most powerful spy agency in the world, and the struggle to evade detection and capture, is fascinating. Greenwald’s disclosures about NSA surveillance capabilities, infrastructure, and the massive and pervasive nature of their spying activities against both foreign nationals and U.S. citizens is both fascinating and shocking. Greenwald takes great care to explain the technology of surveillance and hacking, and also the legal and political framework under which the NSA conducts its activities. Spying and surveillance is as old as human civilization, as is war, prostitution, deceit, corruption, and many other undesirable human vices. The value of surveillance as a strategic advantage and a tool for prevention or interdiction of wrongful acts is not in question. However, moral limits must be observed to protect the rights of innocent citizens, and the US should also recognize rights of non-US citizens. The Fourth Amendment of the US Constitution clearly states “the right of the people to be secure in their persons, houses, papers, and effects, against unreasonable searches and seizures, shall not be violated, and no warrants shall issue, but upon probable cause, supported by oath or affirmation, and particularly describing the place to be searched, and the persons or things to be seized.” The evidence presented in this book appears to resolutely demonstrate that the NSA, acting under the authority of both the Bush and Obama administrations, violated these Fourth Amendment rights both willfully, pervasively, and egregiously. Greenwald succeeded in prosecuting his case concerning excessive and intrusive NSA surveillance. I believe that Greenwald also succeeded in both defining and defending Snowden’s motivation as a whistleblower in the tradition of Daniel Ellsberg’s disclosure of the Pentagon Papers (published in the New York Times in 1971). However, I am still not convinced that Snowden gave due consideration to other options to address the wrongful acts of the NSA. Both Greenwald and Snowden clearly believe in the right and responsibility of a free press to investigate and disclose alleged wrongdoings. However, in this case, I am not convinced that widespread publication was the first and best option. Snowden never availed himself of other options, such as taking his evidence to an elected representative such as a Senator or Representative. The US Congress has 535 voting members, many of whom would have been receptive and responsive to Snowden’s considerable evidence. Public disclosure was a nuclear option which placed Snowden in the position of judge, jury, and executioner of the NSA, and which ultimately has had little real impact on the NSA’s ongoing surveillance. Snowden’s self-righteous motivations may have been just, but I believe his actions are still subject to criticism.